A UN report accuses the United States of downplaying the number of civilians killed in anti-terrorist drone operations, while failing to assist in the investigation by releasing its own figures. With the increased use of remotely piloted aircraft in military operations in a number of countries, the nagging question of civilian “collateral damage” as a consequence of these deadly technologies is a growing concern for the United Nations and human right groups. In Afghanistan, for example, the number of aerial drone strikes surged from 294 in 2011 to 447 during the first 11 months of 2012, according to data released by the US Air Force in November 2012, UN Special Rapporteur Ben Emmerson noted in his interim report. Although the first missile test-fired from a drone occurred in February 2001, it wasn’t until the end of 2012 that the UN Assistance Mission in Afghanistan (UNAMA) released data showing that 16 civilians had been killed and 5 injured due to drone strikes during the course of the year. In its latest published figures, covering the first six months of 2013, UNAMA documented 15 civilian deaths and 7 injuries in seven separate attacks by drone aircraft. Emmerson’s 24-page document, which is due to be presented to the UN General Assembly next Friday, mentions a report by a US military advisor that contradicted official US claims that drone attacks were responsible for fewer civilian deaths compared with other aerial platforms, for example, fighter jets. He pointed to research by Larry Lewis, a research scientist at the Center for Naval Analyses, who examined aerial strikes in Afghanistan from mid-2010 to mid-2011. With the help of classified military data, Lewis found that the missile strikes conducted by drones were “10 times more deadly to Afghan civilians” than those performed by fighter jets, according to a report by The Guardian newspaper. 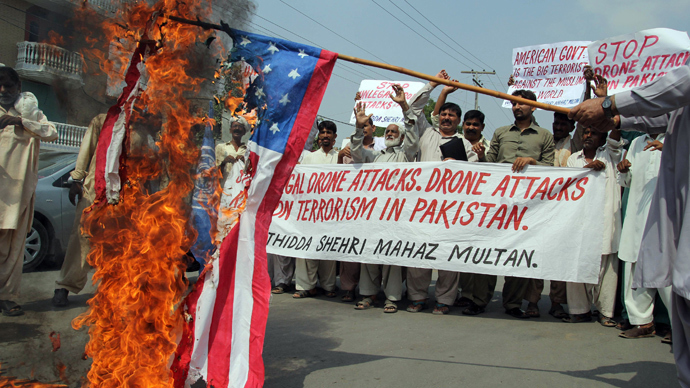 The United States and the United Kingdom have been reluctant to hand over information regarding drone strikes of any sort, including those that result in civilian deaths. For example, on February 21, 2010, 23 civilians were killed and 12 wounded in a Predator strike in southern Afghanistan’s Uruzgan province. “The Special Rapporteur does not accept that considerations of national security justify withholding statistical and basic methodological data of this kind,” Emmerson wrote in the report. The United Kingdom, which also figured into the report, has officially admitted to one civilian casualty incident, in which four civilians were killed and two civilians injured in a remotely piloted aircraft strike by the Royal Air Force in Afghanistan on March 25, 2011. However, that figure remains open to speculation given that the United Kingdom’s ‘Reaper’ drone has flown more than 46,000 hours in Afghanistan, averaging three sorties per day, with a total of 405 weapons discharged. Emmerson also reported that Pakistan’s Ministry of Foreign Affairs provided him with statistics on drone strikes in the Federally Administered Tribal Areas of Pakistan, where the US military has targeted members of Al-Qaeda since 2004. The government noted the difficulties in determining the exact number of civilian deaths due to particular“topographical and institutional obstacles” of the Tribal Areas, including the tradition of immediately burying the bodies of the dead. So the figures are likely to be an underestimate. In September, the Bureau of Investigative Journalism (TBIJ), a non-profit organization launched a project,“Naming the Dead,” to record properly the names and numbers of people who are killed by US drone airstrikes in Pakistan. Civilian fatalities attributed to US drone strikes have occurred beyond the borders of Afghanistan and Pakistan, including in Yemen, where the figure is 12-58, according to Emmerson. Statistics are not yet available from Iraq or the Nato operation in Libya in 2011. Meanwhile, with America’s arch-enemy Al-Qaeda looking increasingly fractured, especially with the death of its terror mastermind, Osama bin Laden, the question as to who now qualifies as a legitimate target of US strikes is becoming more pertinent. More importantly, perhaps, are the limitations that the United States and other countries must recognize as the battle against ‘terrorism’ goes global. The International Committee of the Red Cross (ICRC) has noted the absence of a clear international consensus on the issue, Emmerson noted. But one thing that is generally accepted, however, is that“international humanitarian law does not permit the targeting of persons directly participating in hostilities who are located in non-belligerent States, given that, otherwise, the whole world is potentially a battlefield,” the report emphasized. The Special Rapporteur intends to submit a final report on the subject of robotic aircraft in counter-terrorism operations to the Human Rights Council in 2014.